The server's certificate is unknown. Please carefully examine the certificate to make sure the server can be trusted. 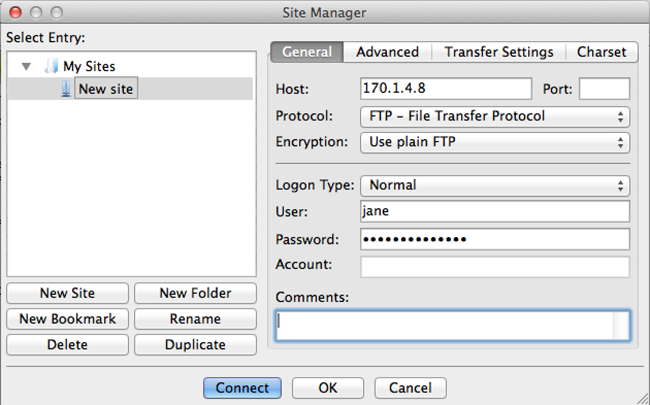 To resolve this error, you must either connect via sFTP or disable TLS in FileZilla's Site Manager. This solution applies only to Linux-based hosting accounts (more info). This solution only works if you're connecting with the primary FTP user. Enable SSH on your account (Web & Classic / cPanel). This solution works for any FTP user. In FileZilla, from the File menu, select Site Manager. Host Enter your hosting account's IP address (Web & Classic / cPanel). Protocol Select FTP - File Transfer Protocol. Encryption Select Use plain FTP. User & Password Enter your hosting account's username and password.